NAZI SMASHERS & NAZI HUNTERS TODAY this is the online archive of real-life modern-day nazi hunters who expose legacies of National Socialism in today's government. http://rexcurry.net/nazi%20salute%209b.jpg Nazism, Fascism, Third Reich, Hitlerism, Gestapo, Brown Shirts, nazi-ussr http://rexcurry.net/swastika3clear.jpg Not to be confused with Rex Steele, Nazi Smasher. 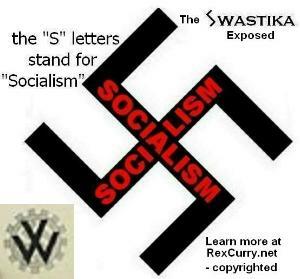 Not to be confused with Rex Steele, Nazi Smasher, this movement exposes legacies of National Socialism in today's government. Support the ongoing fight against the National Socialist German Workers' Party and its atrocious legacies in modern politics. In comparison to the above, Google news indicates that on the same date as above, the abbreviation "U.S.S.R." gave 486 uses and the full phrase "Union of Soviet Socialist Republics" gave 103 uses. The monstrous Union of Soviet Socialist Republics killed 62 million people, three times as many millions of people as did the National Socialist German Workers' Party (21 million). However, any Google news search on any date will show similar results to the random date above: that the Union of Soviet Socialist Republics is referenced 486 times, or one-twelfth the number of times (5,740) of the National Socialist German Workers' Party. 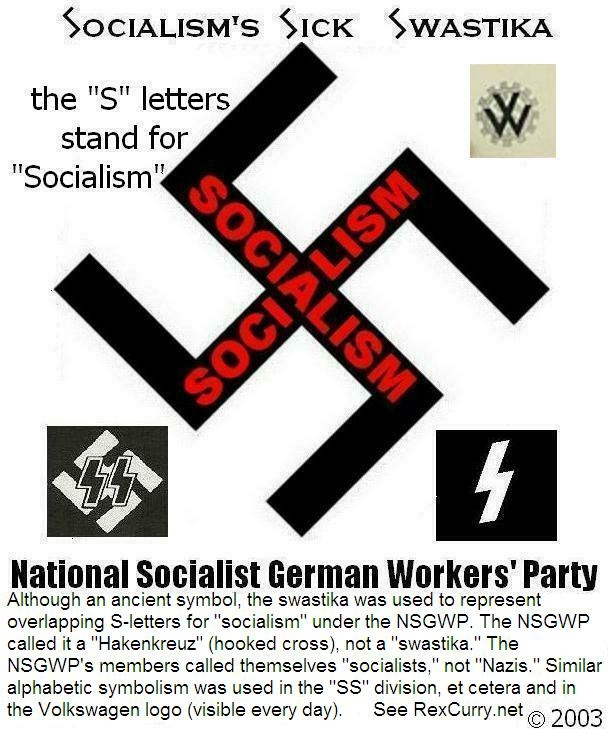 The use of the full phrase "Union of Soviet Socialist Republics" is once in every five uses of the abbreviation "U.S.S.R." The use of the full phrase "National Socialist German Workers' Party" is once in every 1900 uses of the abbreviation "Nazi." The socialist Wholecaust occurred under the industrial armies of the socialist trio of atrocities (see http://rexcurry.net/socialists.jpg): the Union of Soviet Socialist Republics, 62 million deaths, 1917-'87; the People's Republic of China, 35 million, 1949-'87; and the National Socialist German Workers’ Party, 21 million, 1933-'45 (numbers from Professor R. J. Rummel's article in the Encyclopedia of Genocide (1999)). In other words, they were not slaughtered in war by a foreign country invading, they were slaughtered by their own governments by the millions. Sometimes "I told you so" just doesn't seem to cut it. Socialists are nuclear bombs. Socialism is nuclear war.